The expanding middle class in China and India, combined with broader economic growth, will have a significant impact on gold demand. Use of gold across energy, healthcare and technology is changing rapidly. Gold’s position as a material of choice is expected to continue and evolve over the coming decades. Mobile apps for gold investment, which allow individuals to buy, sell, invest and gift gold will develop rapidly in India and China. Environmental, social and governance issues will play an increasing role in re-shaping mining production methods. The gold mining industry will have to grapple with the challenge of producing similar levels of gold over the next 30 years to match the volume it has historically delivered. The best way to avoid getting wet in tomorrow’s economy is to listen to the weatherman, reading experts’ opinions to form your own. The report is available at the World Gold Council’s website. TV Record, Brazilian network just released a story on the garimpeiros (diggers) way of life in the newest gold rush of Mato Grosso (MT). A TVE Record acabou de publicar reportagem sobre o modo de vida dos garimpeiros na mais recente corrida ao ouro em Mato Grosso (MT). 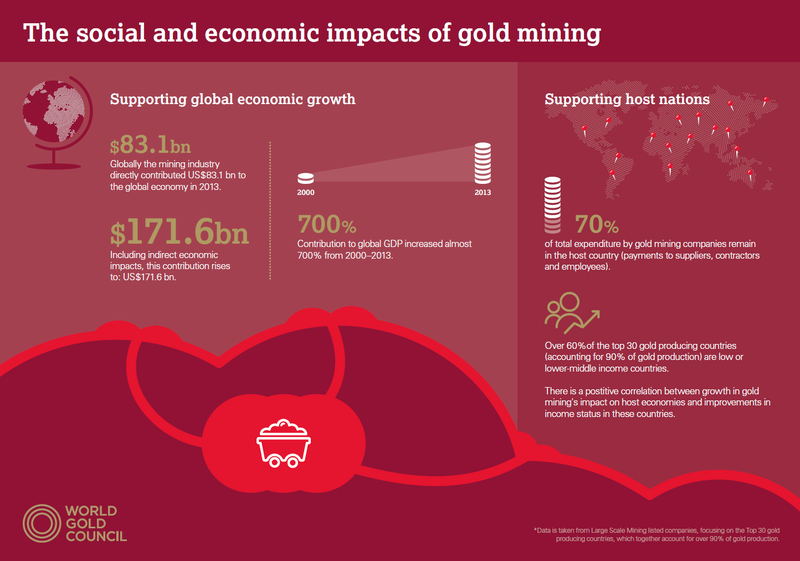 World Gold Council just published a new report on the social and economic impacts of gold mining. The report examines the wider footprint of gold mining and its implications for growth and development. To obtain the full report, just click: the-social-and-economic-impacts-of-gold-mining. You may also visit World Gold Council. Total contribution of over US$171bn to the global economy. Total number of jobs that result from commercial gold mining rises to around 4.2 million globally. In most gold producing countries, over 90% of the industry’s employees are local workers. Over 60% of the countries covered in the report are low or lower-middle income with substantial socio-economic development needs. 70% of the value that gold mining companies distribute within an economy relates to payments to local suppliers and employees. Gold mining’s direct economic contribution to the global economy has increased seven-fold from 2000 to 2013. It’s the crisis, but not the 2008 one. The Portuguese gold jewellery market has shown a marked decrease since it’s heyday in 1999-2000 (either in gold content, USD or EUR value), paralleling the growth crisis of Portuguese economy – clearly unprepared for the EURO currency. Now a small fraction of its volume in 2000, the gold jewellery market seemed to stabilise with last year’s (hopefully) economic turning point. The 2008 crisis had other effects on the Portuguese gold market, gold savings being traded for cash and generating a close to 1.000 MUSD gold export maximum in 2012. But that is the theme for another post. 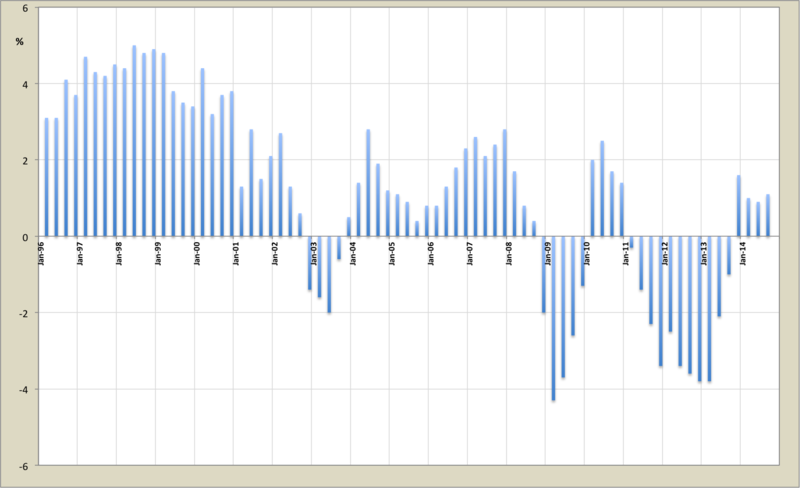 Golden years ahead, perhaps, but not soon – neither for the economy nor for the Portuguese gold market. A crise do crescimento português (gerada pela adopção do EURO, para a qual não nos preparámos) está espelhada no mercado nacional da ourivesaria, quer numa perspectiva de ouro contido – no primeiro gráfico, quer no seu valor (medido em EUR ou USD). 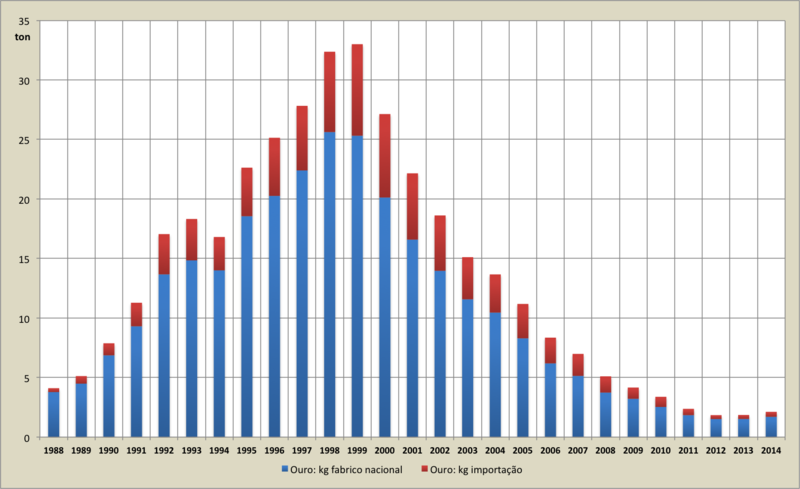 Agora uma pequena fracção do seu volume e valor em 1999-2000, o mercado nacional de ourivesaria parece ter estabilizado, um efeito do ponto de viragem (esperemos…) da economia portuguesa. A crise de 2008 (que muda de nome mas não acaba…) teve outros efeitos no mercado do ouro em Portugal, com a troca das poupanças em ouro dos Portugueses por dinheiro vivo e exportações de ouro que atingiram um máximo de quase 1.000 MUSD em 2012. Mas isto é tema de outro artigo. Os anos de ouro vão, talvez, voltar, mas não é para já – nem para a nossa economia nem para a ourivesaria.